A brief overview of the research past and present conducted by the TCD ASD and rare neurodevelopmental disorders research group (NeuroDev Research), and a look to the future research needs of the Irish ASD community. Autism spectrum disorders (ASD) affect around 50,000 people in Ireland and are caused partly by genetic factors and changes in brain connectivity. We need to understand how genetic risks or altered brain function affect behaviour and outcomes in ASD, and the best ways and therapies to support people with ASD. The Irish ASD community told us through a survey that a registry (database) was necessary to understand the causes and for better treatments, services and earlier diagnosis. We set up a small pilot study to help us design an Irish registry in Kildare/ West Wicklow and more than 90 people took part. In the future we would like to develop an online study and use this to provide up-to-date information on ASD in Ireland to help the development of better services and supports. Funding and resources will be required for this kind of study in Ireland, but it would be very informative. Autism Spectrum Disorders (ASDs) are a group of conditions affecting approximately 1% of the population globally, and around 50, 000 people living in Ireland today. Typically, about 50% of autistic people have an intellectual disability. ASDs are chronic and impairing and are often associated with underemployment, poor mental health and social isolation (Magiati et al., 2014). 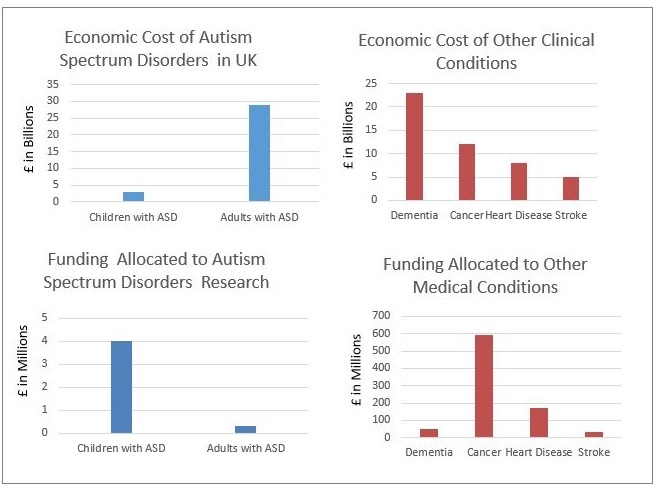 A health economics evaluation conducted by the London School of Economics stated that ASD is the most costly medical condition when the full costs of caring for autistic people are accounted for (Buescher et al., 2014). Despite this, the investment in ASD research has traditionally lagged behind other areas (see Figure 1). Despite the relative underinvestment in ASD research, significant advances have been made in our understanding of genetic risk factors and brain development. For example, we now know that up to 20% of autistic people may have rare genetic mutations, frequently de novo (i.e. not inherited from parents), in genes that are involved in brain development and connections. In parallel with this, brain imaging studies have highlighted that there are patterns of over- and under-connectivity in brain regions in ASD that may be linked to some of the core symptoms of the condition, e.g. social communication difficulties or rigid and repetitive patterns of behaviour. Several major papers from our group in TCD have contributed to these discoveries, for example: Fitzgerald et al. (2017); Merikangas et al. (2015); McGrath et al. (2012; 2013); Delmonte et al. (2013); Pinto et al. (2010; 2012); Anney et al. (2012); Gallagher et al. (2003); Gallagher et al. (2000). The research supports the knowledge that ASD is a condition affecting brain development early in life, in part caused by genetic factors. As a practical outcome of this research it is now standard practice, as recommended by the American College for Medical Genetics, to test all children with suspected ASD for genetic mutations that might be contributing to their condition. Genomics research is now implementing newer genome sequencing technologies to identify tiny mutations related to ASD that have not been identified. In our group, we are about to embark on a new study looking at mutations using whole genome sequencing which will provide even more details about genetic mutations and how genes are regulated, which will further help our understanding. However, there is still so much more that we need to learn about the causes of ASD, including the role of environmental factors to prevent the most disabling aspects of the condition and improve current therapies. Outside research in genomics and brain function, other aspects of ASD research have not been widely supported. 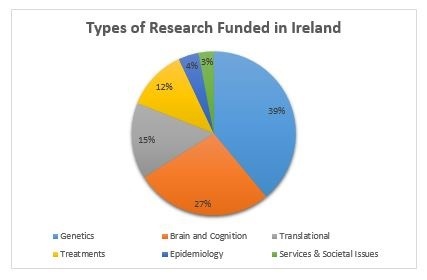 In 2015, we undertook a review of the funding of ASD research in Ireland from 2009-2015 by the major funding agencies and relevant charities to all Irish researchers. We found that the largest proportion of funding was devoted to genetic (39%), brain and cognition (27%) and translational research (15%), whereas far less funding was allocated to treatments (12%), epidemiology (4%) and services and societal issues (3%) (see Figure 2). We also surveyed the ASD community for their priorities for ASD research. “Very Important” themes included ‘adult services’ (91%), ‘therapies or programs that aid day to day life’ (91%) and ‘methods for earlier/easier diagnosis’ (81%). This research highlights that lack of widespread and appropriate ASD interventions is the biggest concern that needs to be addressed. As scientists and clinicians, we argue that high-quality longitudinal research will help to bridge the gap between causes and outcome, and help to deliver better therapies and interventions. Patient registries offer a means for holistic research in complex conditions such as ASD. A registry is a collection of health and personal information that can be used to identify causes of a condition, to predict outcome and help develop services. For example, a recent paper based on data from Sweden’s national health registry highlighted that people with ASD have reduced mortality due to factors including cardiovascular risks, seizures and mental health problems (Hirvikoski et al, 2016). Some registries have been established specifically for ASD research, e.g. the American based Interactive Autism Network (IAN). The IAN was established in 2006 to promote ASD research. It currently has more than 54,000 research participants and has published papers such as bullying, elopement, sound sensitivity and genetics. IAN also demonstrated the feasibility of running an online clinical trial with an Omega 3 study for ASD. Currently, there are two relevant databases in Ireland: the National Intellectual Disability Database (NIDD) and the Physical and Sensory Disability Database. While these have valuable information, they do not currently contain diagnostic information and predominately capture the 50% with an intellectual disability. Consequently, there is no accurate data regarding prevalence and the profile of individuals with ASD in Ireland to inform service planning and development. This is likely to lead to inefficient use of already limited resources, fragmented services and continuing underdevelopment of services. In 2012, together with NUIG, our group conducted a national consultation with the Irish ASD community regarding the establishment of a registry and biobank for ASD and related neurodevelopmental conditions. A biobank is a collection of biological material, e.g. genetic, blood, urine that can support biomedical research. We held town hall meetings (Dublin, Galway, Sligo and Cork) and a national online survey completed by 425 participants, including parents, self-advocates and service providers. 93% of survey respondents agreed that a registry and biobank were required to support biomedical, environmental and clinical research. There was a strong desire for data to better inform development of health, education and social care services. In addition, respondents had a desire for an educational component that could provide information on up-to-date research to the community regarding ASD, causes and therapies. Over 90 families participated in the pilot study up to the end of September 2017. We are currently analysing these data. We can report however that high mental health and behavioural needs were reported by families. A fuller report of these data will follow in due course. Despite the overwhelming support we encountered as part of our consultation for the establishment of a registry, we recruited only 1/3 of our target in this pilot. We had a very proactive public awareness campaign and believe that our outreach to the ASD community was good. Moreover, the majority of those who registered (89%) returned their surveys showing a high level of engagement. We believe therefore that the outdated approach of pen and paper surveys, used by necessity in the pilot study will not meet the needs of the ASD community. Looking to the future, we would like implement an interactive online approach to longitudinal ASD research to promote engagement. Individuals and families affected by ASD have limited time but are highly proactive online. Online engagement in research is likely to be enabling and could provide the desired educational component with up-to-date research and data regarding the Irish ASD community. This is an approach that has been implemented with significant success for rare neurodevelopmental disorders such as Phelan-McDermid Syndrome, which helped to reveal much information regarding this little-known syndrome and has generated interest by both scientists and clinicians to support research and clinical services. Such an initiative for ASD will require resources and research funding investment. However, we believe that it will provide an important resource for families, service providers and policymakers, and promote better services and outcomes for individuals with ASD in the future. In conclusion, ASD research, knowledge and advocacy have progressed significantly over the last twenty years and Ireland has played a role in contributing to that change. However, there is still much to be done. We have an opportunity to propel world-class research and address huge gaps in service provision for young children, adults and the elderly with autism. A national longitudinal study of autism through a registry would provide us with the opportunity to make a difference to the lives of individuals with ASD. Sarah Feighan, BA MSc, is a PhD student in the Autism and Neurodevelopmental Disorders Research Research Group (NeuroDev Research) in TCD. Her PhD is focused on research in ASD and rare neurodevelopmental disorders, particularly using online resources. Louise Gallagher, MB MRCPsych PhD FTCD, is Professor and Chair of Child and Adolescent Psychiatry, Trinity College Dublin. She is the PI of the Autism and Neurodevelopmental Disorders Research Research Group (NeuroDev Research). Her research interests are genetics, brain structure and function and clinical mental health services in ASD.